This challenge was probably the hardest yet. I know that there are abut a million books that have changed my opinion about various things but for the life of me I can't recall any of them. This is probably because change is a process so typically it takes more than just one book to sway me, but certainly they have gotten the ball rolling. After wracking my brain all day I finally came up with one. 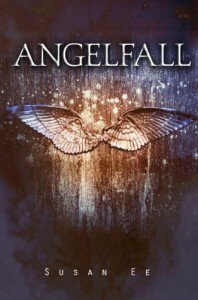 Angelfall by Susan Ee changed my opinion on self published novels. Previously, I had assumed that they weren't worth my time but Angelfall taught me to give self published books a chance. Angelfall is well written, well researched, has great characters, and an engaging and logical plot, something I had not encountered before in the world of self publishing. While I'm unlikely to read a self published novel until at least one of my trusted reviewer friends has rated it highly, I won't automatically write it off either.